The Great Smoky Mountains National Park is filled with a variety of historic cabins from a bygone age. When you visit the park, you can walk into these cabins, look around, and imagine what life must have been like over a hundred years ago. But what if you didn’t have to imagine? In the 1940s and 1950s, visitors to the Little Greenbrier section of the park were greeted by the Walker Sisters, a group of women who looked like they walked right out of the 1800s. These sisters weren’t actresses or participants in some sort of historical reenactment, they actually lived in a log cabin in the Great Smoky Mountains National Park. Born and raised in the Smokies, the Walker Sisters didn’t let the establishment of the national park disturb their traditional way of life. Read on for a brief look at the Walker Sisters’ unique history. While all of the sons eventually left home, only one daughter, Sarah Caroline, got married and moved away. When John Walker died in 1921, the property was left to his unmarried daughters. Without any men around, the Walker Sisters assumed all of the responsibilities on the farm. For the next 40+ years, the sisters would be completely self-sufficient: raising livestock, growing vegetables, and making their own clothes. Although Nancy died in 1931, the five remaining unmarried Walker Sisters were still going strong when the Great Smoky Mountains National Park was officially dedicated in 1940. While most locals caught within the GSMNP’s boundaries moved away after the creation of the park, the Walker Sisters refused to give up their family farm. Eventually, a deal was struck in which the sisters received $4,750 for their land and permission to continue living in their cabin for the rest of their lives. With the establishment of the national park came a host of new restrictions. The Walker Sisters weren’t allowed to hunt, fish, cut wood, or graze livestock. To make the most of their new situation, the sisters became quasi-ambassadors for the national park. When visitors came to Little Greenbrier, the Walker Sisters would say hello and sell their handmade products, such as fried apple pies, crocheted doilies, and children’s toys. Louisa even wrote poems that were available for purchase! Polly Walker passed away in 1946, with Hettie following her the next year. When Martha died in 1951, the two remaining sisters asked the National Park Service to take down the “Visitors Welcome” sign at their cabin, because they were simply too old to do all of their chores and entertain tourists as well. Margaret died in 1962 at the age of 92, and Louisa lived in the house until she passed in 1964. Sarah Caroline, the only sister who got married and moved away, died in 1966. 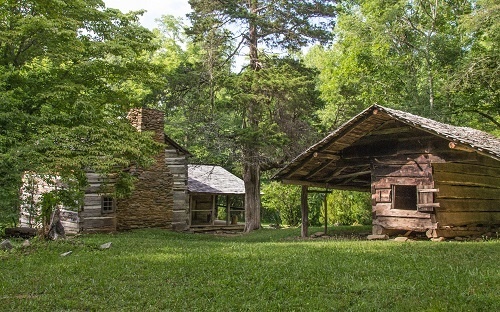 The Walker Sisters may be gone, but their historic cabin is still standing in the national park. The Walker Sisters Place is located along the Metcalf Bottoms Trail. To get to the homestead, first take the 0.7-mile hike from Metcalf Bottoms to the Little Greenbrier School, which was built by John Walker. Then, continue on the trail for 0.6 mile, where the path crosses over a footbridge. After 1.1 miles, hikers will reach the 0.2-mile side trail that leads to the Walker Sisters Place. “Guess it ain’t every soldier in Germany that can say his old-maid aunts raised his socks off’n a rocky mountainside for him.” In lieu of “raised his socks” did you mean “rinsed”? Loved the article! We spend a lot of vacation time in TN, and would love to see this cabin. Hi Kathee. Thank you so much for catching the expect/except error; we have fixed it. You really should be a proofreader! As far as the raised/rinse question; we checked the original quote, and it is actually “raised”. Thank you again for reading and commenting! Thank you for letting me know that. I always love learning something new. I have been told that on the proofreading before. For some reason it sticks out like a sore thumb to me. It’s the same for me. And was for my dad. He would point out all the errors in the daily paper. Karen, I never comment on other people’s personal mistakes, but when I see them on posters or news articles I will. The funniest one to date that I read was, “with friends like that who needs enemas”? At least that one made me chuckle. Hey Kathee, In this case raised would be correct, she is referring to them growing/raising/spinning and knitting the socks. Not sure if they were wool or cotton so terms could be slightly different but she means the sock was wholly created on their farm. The Walker Sisters’ homestead is not located where the school is. I don’t know the exact length of the trail, but it’s considerably more than .7 miles from Metcalf Bottoms. Hi Leslie. You’re absolutely right! We have updated the blog to clarify this. Thank you so much for your comment! None of the pictures above look like the Walker Sisters’ residence; I’ve been there several times. If the first one is indeed their residence, (it bears some resemblance) then the NPS must have moved it to its current location, because it is presently in an incredibly green, pastoral setting. Its current location bears no resemblance to the desolate, rocky slope pictured above. You have a good eye! Unfortunately, we didn’t have any photos of the cabin, se we used some file photos from the same time period. The last picture on the left is the Little Greenbrier School. Thank you for reading and commenting! It’s not the Walker cabin. That’s a cabin in Cades Cove, I believe. My Father’s family claims kinship to the Walker Sisters. I am not sure exactly where the connection ties into our family, but Dad’s Mother’s family came from the Gatlinburg area and we still have other (living) cousin’s in that area. There is even a road somewhere near there named for her family, which I found really cool. We were able to visit there, back in 1998, and see the cabin and other structures. We also visited with some of those living relatives and drove our family road. It was great to feel the history around us. The Smokey Mountains are sooo beautiful. I sure hope the horrific, devastating fires in Gatlinburg and the Smokey’s this week (11/30/16) haven’t gotten to this area. I know these historical buildings can be rebuilt, but the original is such a personal treasure I hope they survive. Hi Lisa. Thank you so much for sharing some of your family history. You have deep roots in the Smoky Mountains! Also, thank you for sharing that wonderful photo of the cabin! We recently obtained our own picture of the Walker Sisters cabin, and we have added it to the blog. How did they heat cabin if they could not cut wood, gather dead? Dead wood and coal, I imagine. Lisa, are you kin to Leon, Billy and Travis walker? I don’t know, Reva. I have cousins I have never met. Where do they live and who were their parents? We found a poem by Louisa in my dad’s files after he had passed. I suspect that his mother and father(my grandparents) had obtained it. The poem is called ‘The Old Pine Tree’ composed by Louisa Walker, Aug. 24, 1941, Sevierville, Tenn and there is a notation (‘R.7’) on the bottom right corner of the page. There is a colored drawing at the top of the page of a landscape scene with pine trees and two blue birds flying in the forefront and two birds flying in the distance. It is a lovely poem.